Krom is the Packmaster of the Hounds, leader of the Blood Hunt. From a young age he found he preferred the company of the camp dogs to the human members of the tribe, though he learned early on that they were not to be tamed, losing his hand in that harsh lesson. Over the years he came to understand the pack mentality of the beasts, learn their language of gestures and growls. Gradually, he became accepted as a member of the pack, living, eating and sleeping with them, rising to become the alpha hound, the packmaster. Krom and his pack roam far and wide over the snowy wastes, tracking prey and scouting out potential raids for the tribe to undertake. 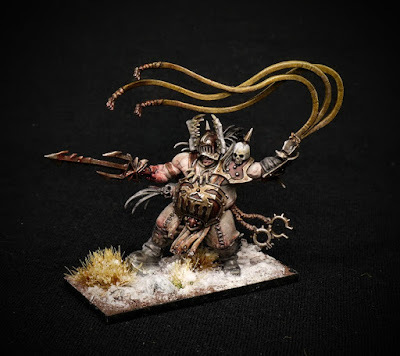 This is the Bloodstoker from the Age of Sigmar starter set. It was the obvious model to lead the hounds, with the whip and the prodder attachment to his arm stump. There's even a pair of jaw bones trophy attached to his helmet, the previous alpha male of the pack? It really is a lovely sculpt and looking at it, I was thinking about just how far ahead of the pack that Games Workshop have become in the production of plastic figures. I was struck by how far they had progressed when comparing the current marauders to some old school models, but these character sculpts are just in a different league. I reckon this model could stand proudly next to any classic metal sculpt of yesteryear. It feels good to be painting chaos warriors again after a break of about two years. 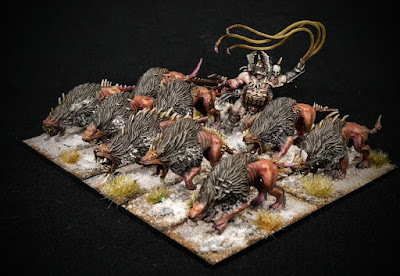 I have another unit underway and have been sorting through my old collection for more ideas. Three is not Khorne's number, but it is my favourite, so hopefully I will be adding a trio of units to the army. 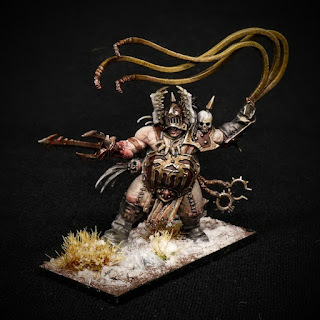 The recent Arctic vortex weather had me thinking about my snow based army, the Chaos Warriors. 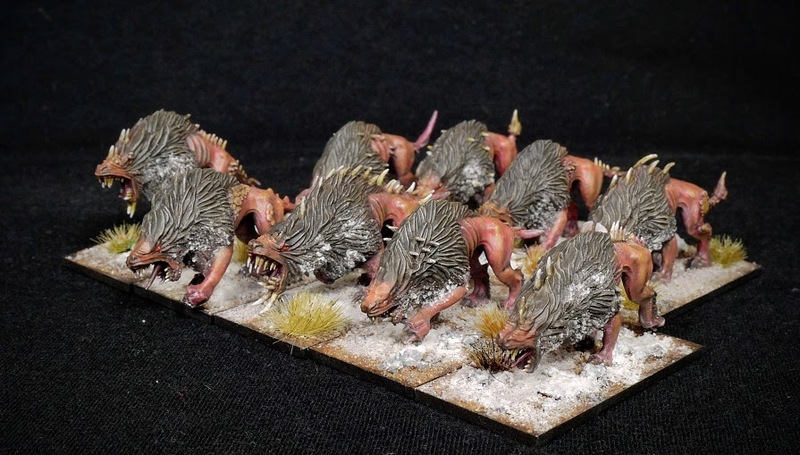 I felt inspired to paint up a unit or maybe more, so I started with these chaos hounds - mini beasts from the East. They are relatively quick to stick together and paint, the time prolonged a little by my decision to not use the provided ears but fill the holes with a little sculpted fur. When it came to painting I googled a few images for inspiration, with half a mind on them being useable as hell hounds/flesh hounds in other settings - unlikely given the snowy bases but there you go, forever optimistic. I settled on a ruddy skin colour, with black fur and glowing eyes. I primed black rather than my usual white, thinking it would save time with the fur. But then I seemed to spend a good while recoating the skin a light colour before applying the flesh colour. In hindsight I should have stuck with the usual white primer. Can you spot much difference between these two marauders? They both have very large axes, horned helmets and a pair of trousers. 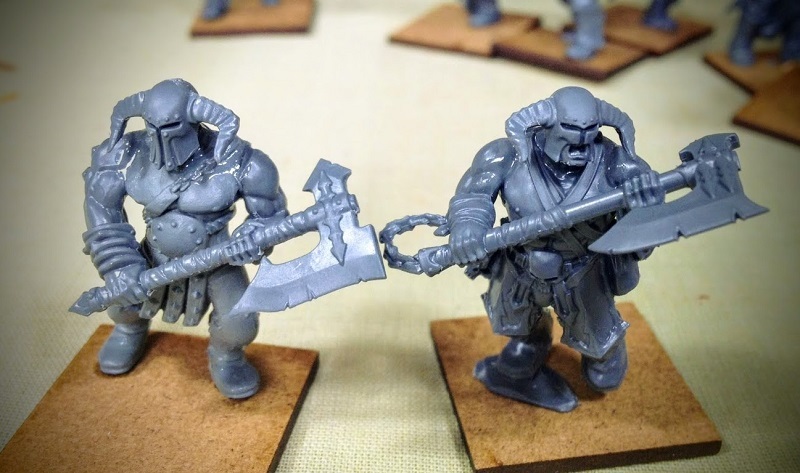 And they are both built from the plastic bloodreavers kit, right? Well, almost. The figure on the right is 100% pure bloodreaver kit - apart from the mdf base of course! The figure on the left has head and arms of the same origin, but the body is the older marauder kit. 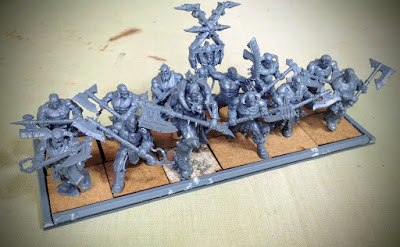 The reason I have this one built is that I picked up a sprue of bloodreavers, built all ten but wanted twelve for a unit, so had to improvise a bit using some old bits. He's a bit scrawny looking and the shoulder join is not perfect, but lurking at the back of the unit, who's to know? And here is the unit in a more contemporary formation, just milling about in random fashion, hoping for a game of Saga perhaps. I like the ranked up look, really must try to get in a game of Warhammer again sometime soon. It's been a quiet month on the hobby front, with nothing to show for my meagre efforts. 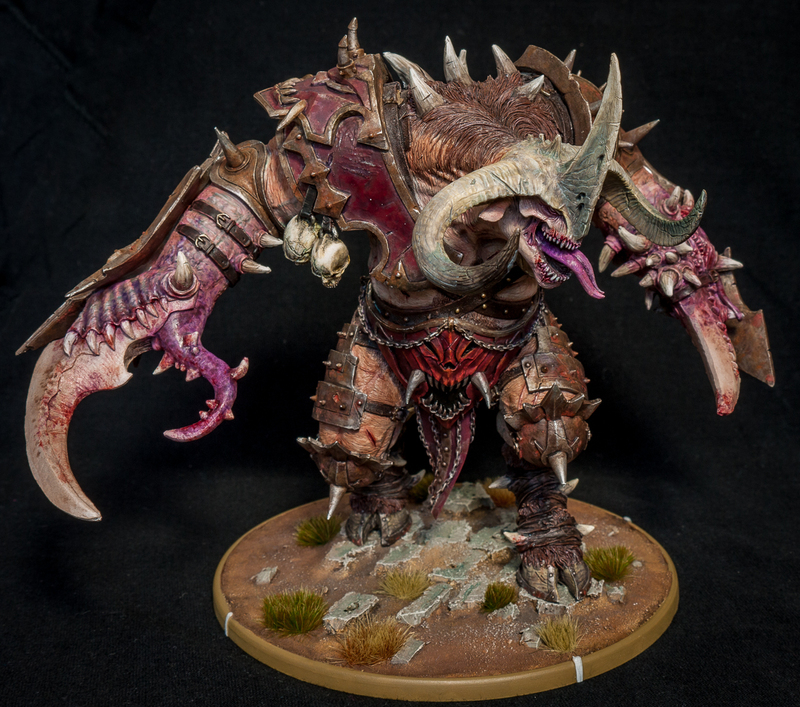 So here's a little filler post, something I painted up for Mierce Miniatures last year. And when I say little, I mean about nine inches high! There's a special offer on the site at the moment, buy one monster, get one free, so if you want to add this beast to your collection now is the time to get him. Smaller monsters are available.